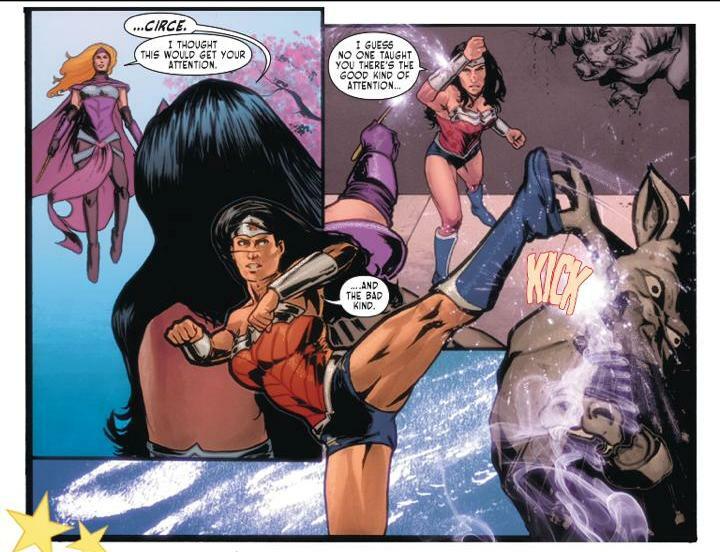 With another weekly installment of SENSATION COMICS we find ourselves on another adventure with Wonder Woman. 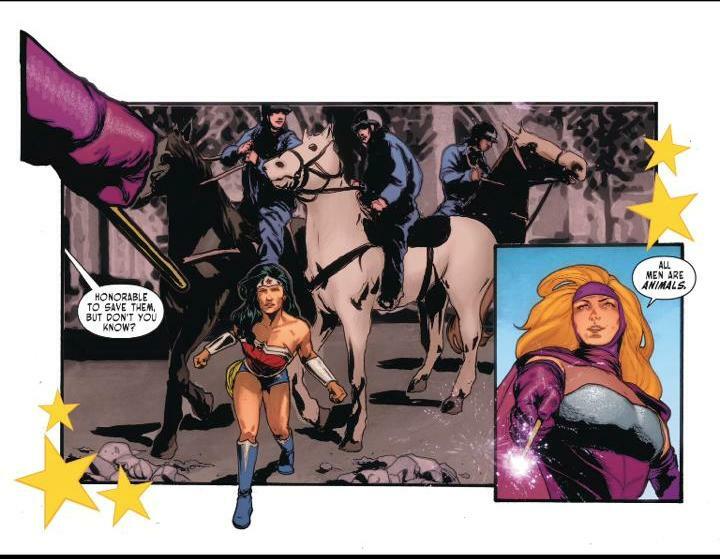 This time it’s a clash with her old foe Circe as the magic wielding sorceress goes on a terror spree with only Wonder Woman to stop her. Amanda Deibert was tasked with this week’s issue and though her message came through strong the scripting was slightly short. 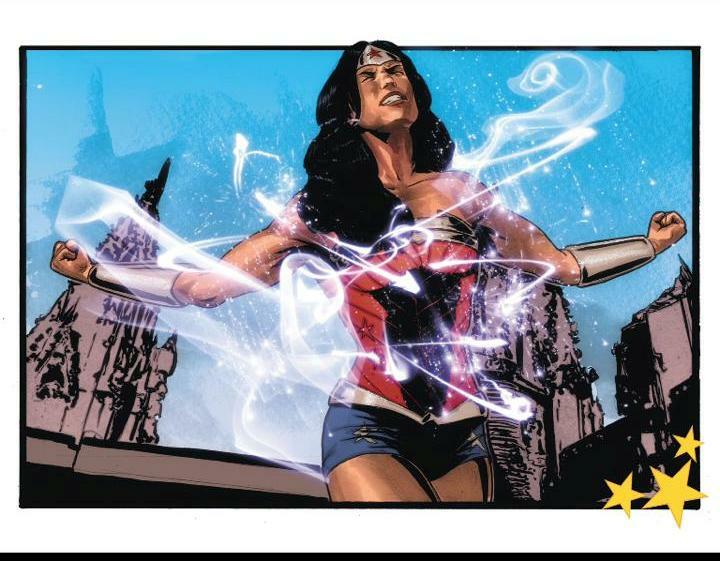 I found that the speech was definitely true to Wonder Woman’s character but lacked a lot of dialogue in favor of heavy art worked pages. Though sometimes it’s not always about the amount of words but how powerful they are. In the true spirit of the female hero, the message not to be afraid of who you are or what you believe is very clear. 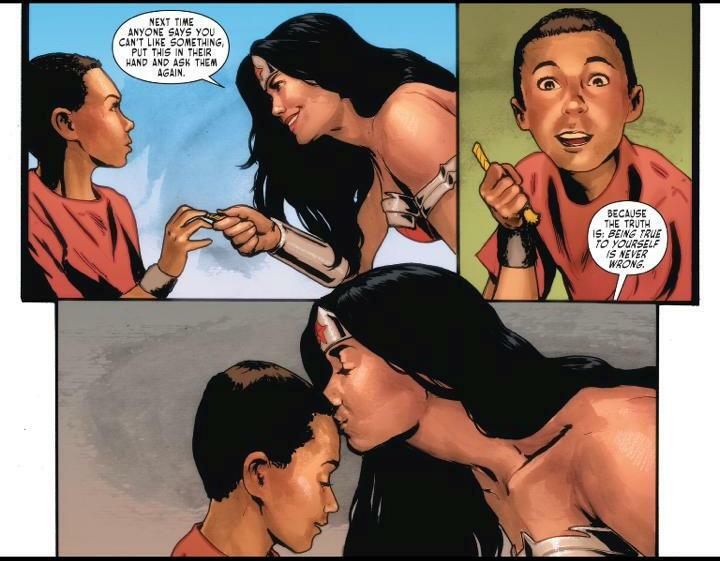 It was a beautiful way to end the story and truly embodies what Wonder Woman is all about. When she cut her rope to give to the boy it reminded me that she was always the most giving and loving of superheros. Amanda Deibert captured that essence even if the story felt a little rushed. Cat Staggs and John Rauch took up the artwork of this issue giving a clear difference to the last story arc. With heavy featured panels and sketchy lines it didn’t seem to match the beauty of the story. Though the magical elements are wonderful, the overall art was messy and the page panels look misplaced making them hard to follow. This didn’t allow the story to flow as much as I had hoped leaving big white boarders to fill in the rest of the page. It honestly felt a little lazy and didn’t really use the space they had to work with as much. However, the centaurs that appear were excellently drawn and gave that mythic vibe back to the issue, tying in Wonder Woman’s Greek roots. 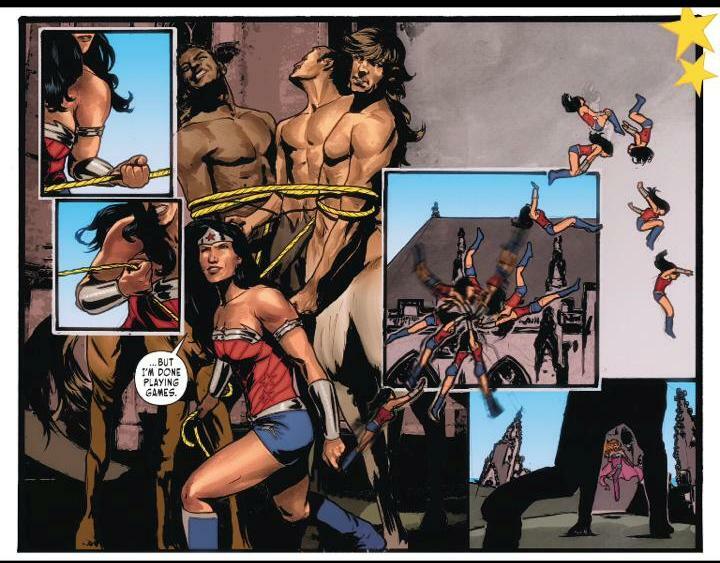 It’s wonderful to read the feminist spirit of Wonder Woman being captured in the SENSATION COMICS. This is something that girls AND boys all over the world admire when reading about the famous superhero and it translated wonderfully into the issue. You don’t always have to be a boy to read Superman and you don’t have to be a girl to like Wonder Woman. A hero is a hero no matter what gender, race or species as long as they save and help a person that’s all that should matter. It was a stunning message that everyone has their own Wonder Woman to look up to in their life and even when people tell you it’s silly, if you believe that’s what will make you strong. Unfortunately the artwork and some of the scripting did let this issue down. I would have liked a little more banter between the old rivals and to have explained just as to why Circe was causing trouble. Also these are women that need beauty and grace. 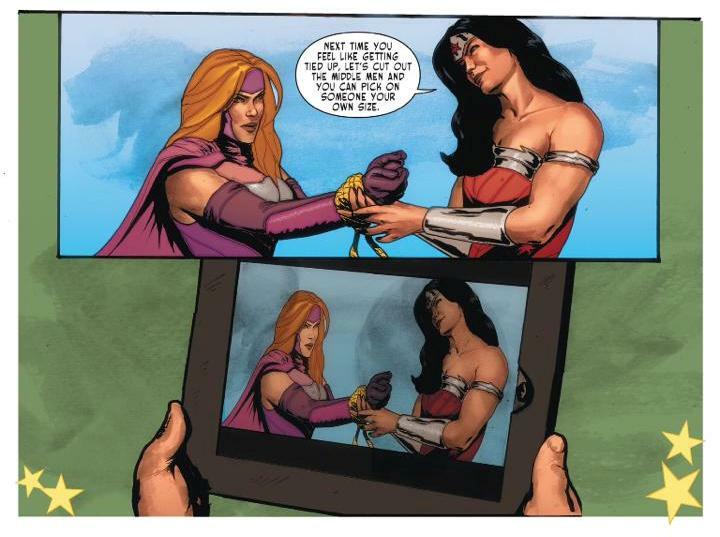 Despite being Amazons they are still supposed to be feminine in appearance but the artwork didn’t quite hit that mark. This was a shame because it would have tied in the message more solidly into the entire issue. The short adventure was a sweet reminder of why heroes do what they do best. This week issue of SENSATION COMICS was a tribute to those who believe and those who will always fight for justice. This series keeps getting better and better every week so stay tuned for more escapades with your favorite female superhero.